This is one of the most popular and mostly often made rice recipe in South India. This gives a very refreshing and tangy flavor to the rice. This is basically made from left over cooked rice or with boiled rice also. Serve Lemon rice with Mint-Cucumber raita and Papad for a simple yet tasty meal. This recipe made by with boiled rice. 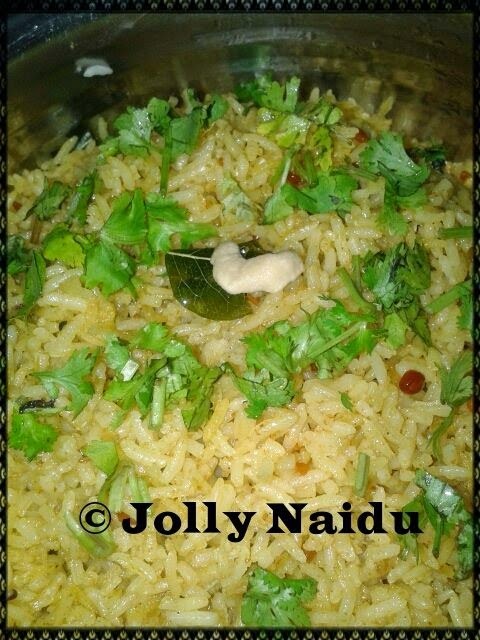 This rice recipe is a great option for any meal on those days when you are very lazy and don't feel like spending much more time on kitchen ;) :) It is simple and easy to make also. 1. First cook about 1 to 1.25 cups rice in 4-5 cups of water till the grains are cooked completely. 2. Drain and spread the rice on a plate or in a bowl. Cover and let the rice cool. 3. In a small frying pan, first roast the peanuts till they are crisp and browned. Remove the peanuts and keep it aside. Then in the same frying pan, roast the cashew nuts till light brown. Remove it and keep it aside. 4. Now heat the oil in the same pan, add the mustard seeds, urad dal and chana dal. Crackle the mustard and brown the chana dal. 5. Add the red chilies and curry leaves, fry it for almost 12-15 seconds , then add the peanuts and stir. 6. Add the asafoetida and turmeric powder, fry for 2-3 seconds on a low flame, so that the spices don't burn. Switch off the fire and add the lemon juice along with salt. 7. Stir and immediately pour this mixture on the rice. Mix all well and keep the lemon rice covered for the flavors to blend for 4-5 minutes. 8. 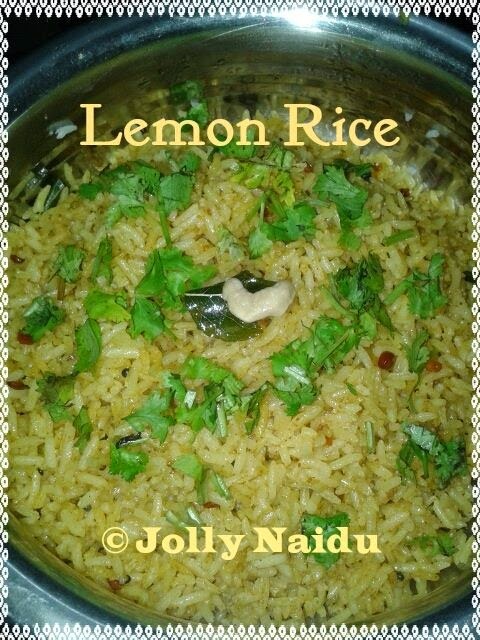 Your Lemon rice is ready to serve with papad, chutney or just have lemon rice with plain curd also. Garnish with chopped coriander leaves.